A Christmas Light Display from Old Town Alexandria to Washington, D.C. The Alexandria Holiday Boat Parade of Lights is a favorite holiday celebration in both Old Town Alexandria and Washington, D.C. Festively decorated pleasure boats light up the sky along the Potomac River including dozens of powerboats, sailboats and the District's fireboat, the John Glenn spouting water 70 feet into the air. The brightly lit boats are creatively decorated as they compete in categories such as "Best in Show," "Best Thinking Outside the Christmas Box," and "Hardiest Souls." The Waterskiing Santa will have a boat in the parade, to celebrate his upcoming show in Alexandria on Christmas Eve. 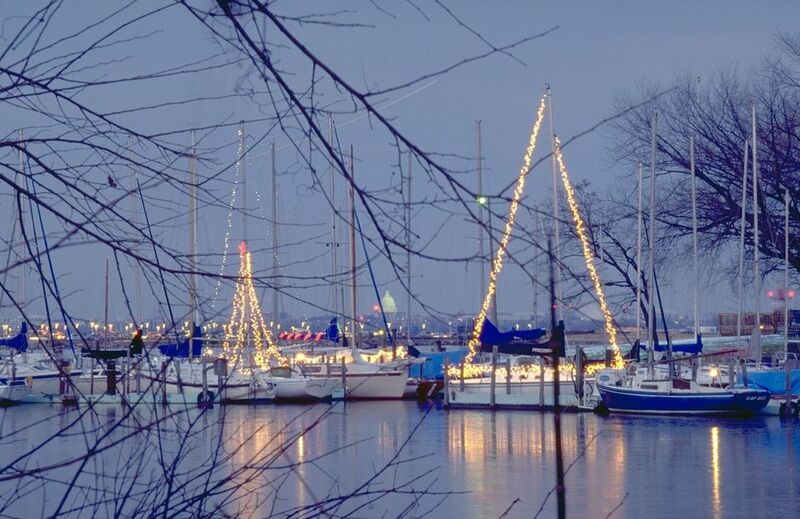 The boat parade is the culmination of a full weekend of holiday festivities throughout Old Town Alexandria. The Wharf development is open on the Southwest Waterfront and will be also hosting holiday events. On December 1, activities like s'mores, hot chocolate, and music kick off at 6 p.m. at The Wharf, then boats arrive at 7 p.m. and a fireworks finale happens at 8 p.m.
7:00 p.m. - Boats arrive at Washington Channel, Washington, D.C. The best place in Northern Virginia to view the Alexandria Holiday Boat Parade of Lights is the from the docks of the Alexandria marina. The Alexandria Waterfront is located behind the Torpedo Factory Art Center, which runs north along Union Street, between King and Cameron Streets. See a map of Alexandria. The closest Metro stop is King Street station, which is about 10 blocks to the east of the waterfront. You can walk from there or take the free King Street Trolley. On-street parking and public parking lots are available within walking distance to the waterfront. Read more about parking in Old Town Alexandria. The Wharf Waterfront is located in Southwest Washington, D.C. along the Washington Channel, just south of the National Mall. The closest Metro Stations are Waterfront and L’Enfant Plaza. See a map and directions. On-street parking and public parking lots are available within walking distance to the waterfront.